A function such as Indesign and PagePlus would be better. There you can save the file as a package. 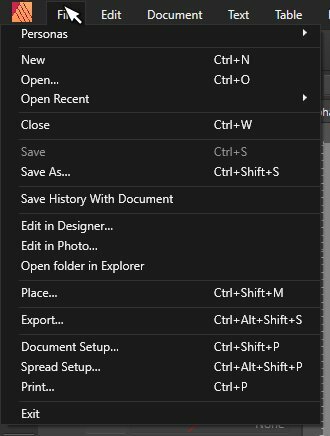 All images, graphics and fonts are saved in one folder and the program is told that the location of the images is now in the package folder. This is useful if, for example, you have to send the typesetting files to an agency, the publisher, etc. If you rename your image folder or move it to another hard drive or uninstall the fonts it will be hard to make everything available for AP again. I hope the publisher will still get this feature. That is a real good idea. I only see one post from you on this page, but if you do accidentally post the same message twice you can use the ‘Hide’ option at the bottom of the posted message so that only you and the moderators can see it. In Indesign it is File> Package. It can be really frustrating when you transfer a file to another computer only to find that you are missing either an image or a typeface. The “Save as Package” feature allows you to gather together all the files that you’ve used in a publication, including fonts and linked graphics, for easy transfer to another computer or to a print bureau. 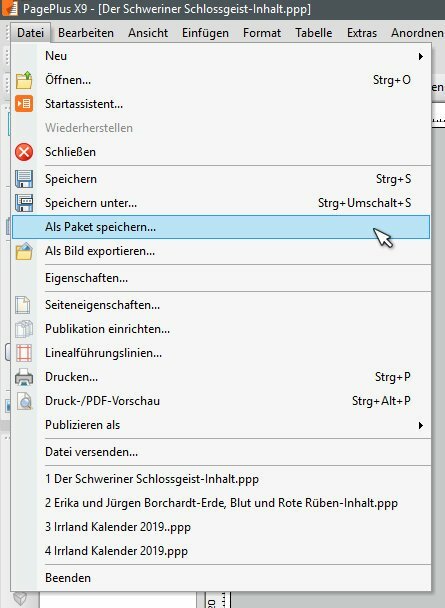 When you package a publication, you create a special PPP file that contains the linked resources. This can be opened and extracted at a later date and will preserve the file links. This method allows you to continue work on the publication, without having to worry whether you’ve overlooked supporting resources. By including resources such as bitmaps, movies and sound files, regardless of whether they are linked or embedded, documents can be guaranteed to open on any machine. Including referenced fonts ensures that they will always look the same. Type a name for your publication and choose a destination folder. Click Save. The Save as Package dialog appears. Check the Fonts option to include any font files within the package. The Linked Resources option is checked by default. Click OK. The file will be saved as a PPP file, but one that has special properties that allow PagePlus to recognise it as a package when it is next opened. When you save the file as a package, the file size will increase as it will include all of the resources and/or font files that have been used. Please bear this is mind if you intend to email the document as an attachment! This is not always the case. Restricted fonts are not included in a PagePlus package, but PP doesn’t warn the user about such omissions. Nobody will be forced, but many people have planned to transfer their workflow from PagePlus to AP. When I heard that PP would be withdrawn in favour of AP I put on hold a decision to change publishing programs because I assumed that AP would have the same functionality. I use PP to create a 700+ page book each year and updating it without inline graphics would be a nightmare. If AP isn't going to have inline graphics, I could have swapped to, and learned, another publishing program at least a year ago. I also bought AP and AD because they would integrate with AP. I expected that some features might no make the first release - perhaps Indexing or TOCs - but not being able to anchor my illustrations to the text they refer to is a huge ommision. We have the same plans to move our brochures and publications over but have the same issue as Jeff. Ours is a bit more. In the modern day, 21st Century enterprise environment the executive/professional have little time to manage printed materials and depend on video/graphic delivered communication. We are moving to publications that are created for an automated publication environment delivering book/magazine flip/page-turning deliverables. We are regenerating our PDF documents into flip page formats to maintain the familiarity and comfort of the traditional publication while delivering embedded modern communications graphics and video media. Text anchored pictures, as well as video and reference linking, is very important in modern publications as printed media becomes more and more obsolete. If a picture is worth a thousand words then video messages are a magnitude more valuable. It PagePlus worked well in 21st Century publication. We could embed video within our publications. It appears that without this ability we have to reserve space using a graphic or other object and use a two-step process to embed videos with a PDF editor if mastered in AP. If I recall correctly, the preflight options on older versions had the option to package in the preflight tool.
" ... printed media becomes more and more obsolete." Maybe in your industry, but certainly not generally! Yes, in some cases Inline graphic are necessary. In some cases you need other software because of the need of inline graphic features. I have a document with about fifty tables inline with the text. I can’t imagine being able to handle that without errors unless tables can be inline in the text. You're not missing anything. No inline/anchoring anything at this time. I know it will come too, as I know the programmers working on it. There's no point in me even attempting to do this in Publisher as it stands. It is still in beta too, so if the textbook is an official project, probably best to use something else anyway. Aside from what fde101 wrote about APub being still being in beta (for me, as in it may not open in later betas or otherwise be unusable), for a book of 55 illustrations I likely wouldn't bother with images/illustrations being in-line anyhow. Aside from what fde101 wrote about APub being still being in beta (for me, as in it may not open in later betas or otherwise be unusable), for a book of 55 ﻿illustrations I likely wouldn't bother with images/illustrations be﻿ing in-line anyhow. If images are added after the text is in and formatted, it's pretty easy in most layout applications to add the images where they belong in context. The text simply flows after the placed image and there is no real issue with an image's context in this way. 55 images are not very many. No worries. I would also use a different application for various other reasons. And none of them would be a changing, beta status even if I have used them since their origins. For my work, position of the images in regard the page is more important than position in regard of actual text content. It is enough that image is in about the same page as thecorrespondingtext content is, but after that relation to margins and other page elements is more important. That is why I place and format text first, and place images after, non-anchored.